Whether it is for Thanksgiving or the Holiday season, surely turkey makes every dinner a sumptuous one. Therefore, if you are looking for the best turkey in town, you must check your local grocery store where you can find best quality turkey. It would be best if you will do the cooking by your own self. It will only take less than half an hour to cook a turkey using the roaster oven. Apart from the turkey, you can add up some side dishes as well such as fresh vegetables, mashed potatoes, peas and the like. Shop for best quality turkey. Be sure you get the fresh ones since they give out that distinct quality taste which is far better than other frozen turkey you find in the market. Next thing that you must do is prepare the turkey. You need to have it thawed. Be sure there are no more giblets left inside the turkey. Then, place it on top of the meat rack of the roaster oven. Brush the turkey with the use of melted butter; season it up with a dash of salt and fresh cracked black pepper. Set the oven for 350 degrees. This might be a higher cooking temperature compared to what you usually use when cooking a turkey. However, the roaster oven has a feature to cook food faster compared to the traditional oven. Next is to stick the thermometer right towards the thickest part of the turkey’s thigh. Set the thermometer to turn off when the temperature hits the 180-degree mark. You also have the opportunity to take a look at the thermometer and at the same time can determine what time you will start cooking other dishes. Per pound of turkey, it takes about 15-17 minutes. Therefore, for a 10 pound turkey it will take about 150 minutes to cook or 2 1/2 hours to cook when using a roaster oven. 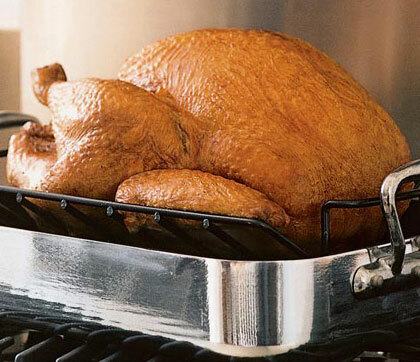 To determine whether the turkey is cooked or not, look at the skin of the turkey, it should have this brownish color. Of course, check the thermometer as well in order to determine the internal temperature of the bird. After the turkey is cooked, it is now to serve the bird. Use oven mittens in order to grab and hold the handles of the rack. Place it on the table. Get a carving knife and carve the turkey and serve.